You may have read my (Martin’s) post about the relative merits of West Indian batsmen Shivnarine Chanderpaul and Chris Gayle. Well, their contrasting skills and chosen cricketing pathways were brought into the sharpest of reliefs a couple of days ago. Gayle slammed an astonishing 128 off only 62 balls for the Royal Challengers Bangalore in the slugfest that is the Indian Premier League. Meanwhile, in a much colder climate and in more challenging conditions, Shiv carved out a typically nuggety 87 not out to prevent the West Indies team from total humiliation on the first day of the first Test match against England at Lord’s. 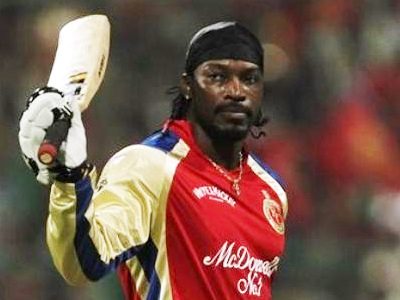 Gayle was all imperious brute strength and clean hitting; Shiv was all impervious chivvying and poking. The crazy situation is that, as far as I’m concerned, Chris Gayle should be representing the West Indies in England and not playing in the IPL. Sure, Gayle likes playing the short boom-boom form of the game more than Test cricket. He prefers being paid a lot of money to entertain tens of millions of adoring fans in a warm climate more than being paid peanuts to stand around in front of thousands of murmuring spectators in the cold of an English spring. But, boy, the West Indies could use his style and skill right now. Gayle isn’t wholly to blame. The West Indies Cricket Board (WICB) have been in a power struggle with Gayle and a number of West Indies players for a good while now. Several of them are playing in the IPL instead of representing their region in England. Once the IPL is over, Gayle may arrive for the one-day tournament that follows these Test matches and wow the crowds in England as he did in India. But I won’t be the only one that questions his priorities; just as I’m not the only one who recognizes that professional sportsmen are entertainers who are going to make decisions about where their market strengths lie. Image | This entry was posted in Cricket, IPL, Right Off the Bat Website, T20 Cricket, West Indies and tagged Chris Gayle, Shivnarine Chanderpaul. Bookmark the permalink. I don’t question Gayle’s priorities. There is a scene in Moneyball where Beane explains how to tell a player he has been traded: not to sugarcoat it, they are professionals, professionals get traded sometimes. Neither the WICB (nor any other cricket board) respond to loyalty in kind. If Greenidge and Haynes were reincarnated tomorrow Gayle’s international career would end, no recompense, no payout, no pension. Even if the WICB could pay him at IPL rates, he owes them nothing. Nor any other player past or present; even cricket’s hallowed international amateur era from 1912 to 1977 was the consequence of boards bullying the players out of a pay-day from a format their forbears had invented. MLB players would certainly understand; unlike the NBA players, they never went to the olympics, clashing as it does with the season proper. FIFA and other global bodies are smart enough to separate international and domestic commitments such that very few players have to make a choice. If they did, they’d almost certainly play a world cup without the likes of Messi, Ronaldo or Rooney. Which means it isn’t really a WICB problem, but an ICC one (meaning a BCCI, ECB and CA problem, because they are in control). And if they cannot sort it out, then perhaps the players will need to sort it out for them.